The KBOJ is a a KBO block featuring our KJ3 cam cleat. The block with a cleat may be any kind of block to which a jam or cam cleat has been attached. There are also V-cleat models. The cleat offers the possibility of immobilizing the line and, thus, the block in a given position. 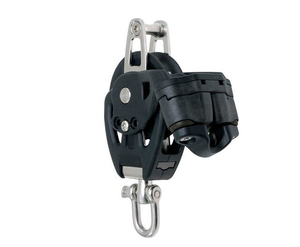 The angle of the cleat with respect to sheave orientation and the user's position is fundamental. It is important to be able to make fast and slack the line conveniently. Choice will depend on line diameter and tackle configuration.